A rare American flag that was flown during the Civil War has returned to its roots and will soon be on display at a military history museum in Maine. 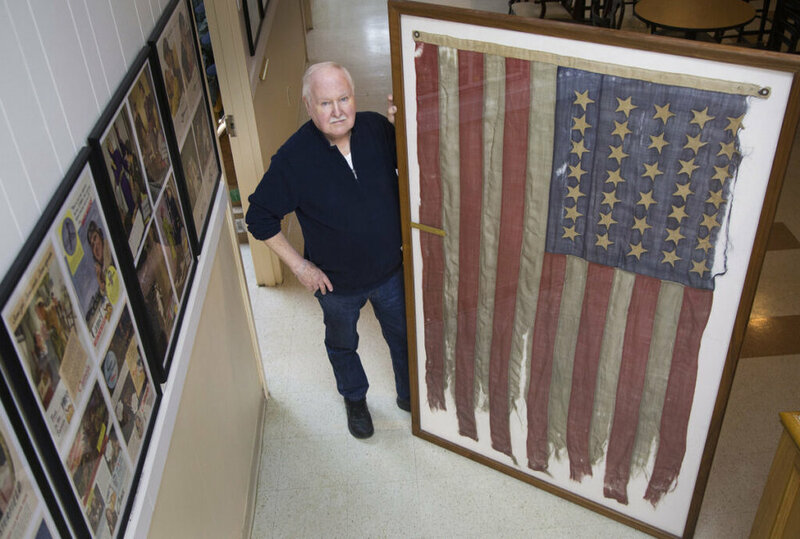 “It’s tattered to pieces, but beautiful,” said Lee Humiston, the founder, director, and curator of the Maine Military Museum in South Portland. The flag, which has 35 stars, belonged to Major James H. Whitmore, a native New Englander who fought with the 15th Maine Volunteer Infantry Regiment in the Civil War. It arrived at the museum on March 9, according to the Portland Press Herald. 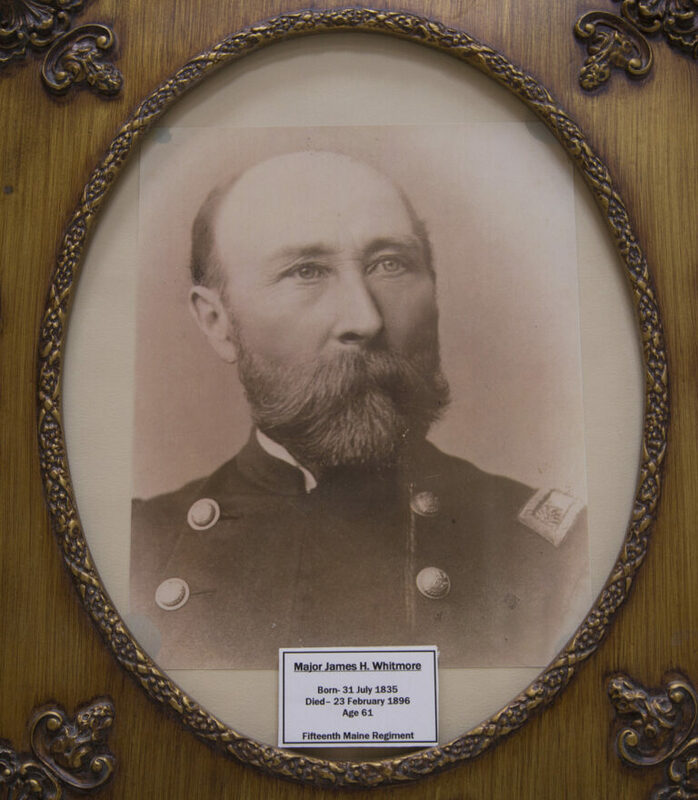 Whitmore was a commander of Company B of the 15th regiment, which was organized in 1861 and saw action in Florida, Louisiana, and Texas. “They were the first unit to hit the ground in Texas,” Humiston said in a telephone interview. According to an obituary in The Boston Globe, Whitmore served with Major General Benjamin Butler in New Orleans and Major General Nathaniel P. Banks at the Red River expedition, which was a series of battles that took place along the Red River in Louisiana. Whitmore was born in Bowdoinham, a town about 30 miles north of Portland, and worked as a teacher for “some years” before he moved to Massachusetts and settled in Lynn, where he “followed his trade as an expert mason” and also worked as an inspector, the Globe reported. After Whitmore died in February 1896, his daughter inherited his American flag, and then she passed it on to her nephew, George Meshko. The keepsake from Whitmore’s war years became a cherished family heirloom, and very well could have remained out of public view for years to come. But that changed when Humiston got a phone call from the son-in-law of Whitmore’s great-grandson. He told Humiston that the flag was in Denver, Colorado and the family wanted to bring it back to Whitmore’s native state. That was back in November. After agreeing to donate the flag to the museum, they then began figuring out the logistics of getting the precious flag from Colorado to Maine. The flag measures about five-and-a-half feet tall and seven-and-a-half feet wide, and one shipping company quoted them a price of $50,000 to fly the flag to Maine, according to Humiston. The family ultimately ended up paying close to $900 to put the flag in a protective crate and an additional $2,000 to ship it by truck from Colorado, he said. The truck began its cross-country journey with its patriotic cargo on March 1 and it arrived at the museum eight days later, he said. “It got here safe and sound,” he said. Joyce Huntley, 92, of Dunedin, Fla., said she’s happy that her great-grandfather’s flag is in the museum where it can be viewed by all. It was very special to her great-grandfather. The flag will be put on display at the Maine Military Museum along with some Civil War rifles and a picture of Whitmore. History buffs who would like to see it for themselves are welcome to visit the museum any weekend between 11 a.m. and 5 p.m. (from Memorial Day to Veterans Day the museum will be open six days a week, Tuesday through Sunday). Humiston said the flag is the only intact Civil War artifact from the 15th Maine Volunteer Infantry Regiment that he’s ever seen. “It’s a beauty,” he said. The descendents of Whitmore are pleased to share this piece of family history with the museum, and relieved that the flag is back in Whitmore’s home state of Maine. “Our flag has come home,” said Huntley. Newer PostWere the Letters Ordering the Assassination of Jefferson Davis Real?